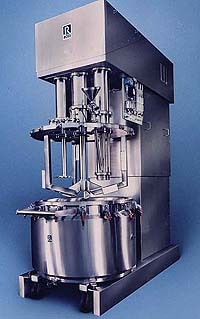 Charles Ross and Son Company Sanitary PVM 200-gallon VersaMix was designed to produce sanitary emulsions in short mixing cycles. The versamix is comprised of three agitators, which are independently controlled. It is equipped with a three-wing anchor that sweeps the vessel wall and generates axial and radial flow. The VersaMix is equipped with SLIM Solid/Liquid Injection Manifold that eliminates the delay that can be encountered when adding solids and liquids during the mix cycle. It also comes with Teflon scrapers mounted to the anchor that removes material from the wall of the jacketed vessel. The jacketed vessel is fitted with a cone-shaped bottom that ensures thorough discharge. The Sanitary VersaMix is available in sizes from 1 to 500 gallons. Independent variable speed drives and complete control package are optional. Click here to download more information.